The John Deere Horst factory in the Netherlands has produced its 1000th self-propelled sprayer, a 4000-litre capacity R4040i. This special landmark machine was handed over to a farm business from the Czech Republic at a special Gold Key ceremony held at the factory in February. John Deere Horst has taken only nine years to reach this significant production milestone for self-propelled sprayers. Only one year ago the factory also celebrated the production of its 10,000th trailed sprayer, since manufacturing of the first 800 Series machines started in late 2000. The Horst factory has a long tradition in the plant protection industry, with over 70 years of experience in designing and manufacturing crop sprayers for the European market. In 1997 John Deere bought the business of Dutch manufacturer Douven, including the Horst facility, which has since been extended and developed to increase production capacity. 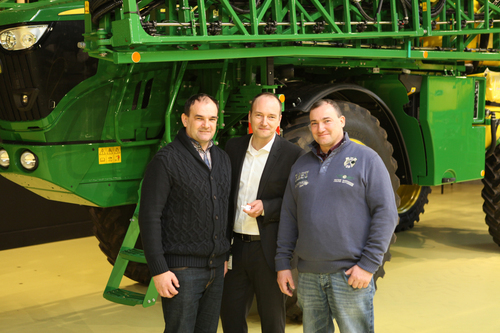 The Gold Key for the 1000th self-propelled sprayer was handed over to Czech customers Miloslav and Zdenek Lukas at the new factory visitor centre, which only opened in 2016. The R4040i will be used this season on the brothers’ 1800ha family farm. It is equipped with a 4000-litre tank and a triple folding 24/36m variable geometry spray boom with automatic control of boom height and tilt. It also features hydraulic tread width adjustment, allowing fast and easy changes for different tramline or row widths. The sprayer’s SolutionCommand electronic valve control system provides precise filling, easy chemical incorporation and an automatic rinsing system with multiple operating modes. Located 40km north of Prague, the Lukas’ farm operation grows mainly wheat, barley and sugar beet. The brothers started farming in 1994 with only 4ha and they continue to grow their business, with plans to expand up to 2000ha. Their machinery fleet includes two John Deere T660 HillMaster combine harvesters and an 8345R tractor.